When Bear can’t sleep, he goes on an adventure and discovers the wonders of New York City—a parade, Central Park, hot dogs, and more! But when he finally gets tired and looks for a place to rest . . . he learns why it’s called the city that never sleeps. What’s a bear to do? Caroline Nastro’s gentle adventure and Vanya Nastanlieva’s engaging illustrations are sure to comfort and delight! A little bear who can't sleep wanders the snowy woods in his nightcap and pajamas with his pillow tucked under his arm; he eventually arrives in "the city that never sleeps": New York City. 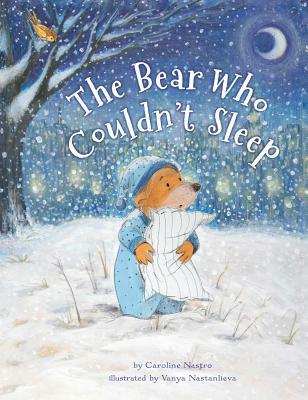 Appealing, comical illustrations juxtapose the clamor and wakefulness of the city and the growing sleepiness of the sightseeing bear in this warm, just-right bedtime story. Beginning with an adventure and ending with a soporific scene, here’s a satisfying bedtime book with broad appeal. Hushed mixed-media artwork comprised of pencils, pastels, and a touch of watercolor, rendered in muted shades of blues and grays, is quietly stunning, particularly a spread of Bear curled up at the bottom of a tree dappled in snow, illuminated by the hazy yellow beam of a park ranger's flashlight. Bear eventually stumbles home, walking, walking, walking back to his family "and the quiet sounds of winter." VERDICT A first-rate debut that deserves a spot on storytime shelves to share with little bears everywhere. Cuddle up with this Bear and his pillow for a just-right bedtime story.